Minnows are a popular bait option for many anglers, but do you know the difference between the various species? Understanding these differences can help you excel during your next fishing adventure! These minnows are usually one to three inches long and are available all year long. In particular, fatheads are great for targeting yellow perch in the fall and are considered excellent walleye bait as well. These minnows are usually around three inches long and are effective during winter, spring and fall months. Many anglers use these minnows for targeting walleye. These minnows are usually between two and a half and three inches long and have a limited availability, usually during the spring. These minnows are great when walleye fishing. These minnows are usually between three to four inches, but they can grow to nearly a foot long. They’re available at all times during the year and are considered a top bait choice for northern pike in the summer. Please note Michigan has several bait restrictions in place to prevent the spread of fish diseases. 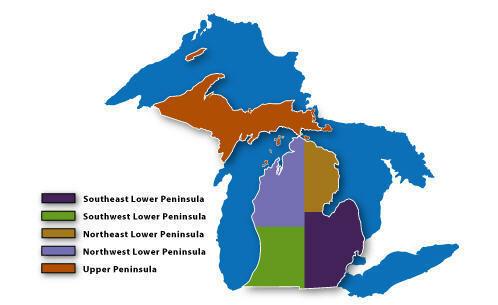 Information about these restrictions and regulations can be found in the 2013 Michigan Fishing Guide. Attention Anglers: Starting September 5, the Weekly Fishing Report will be accessible through a new toll-free telephone number. You will still be able to obtain news and information regarding fishing conditions around the state by simply calling 1-855-777-0908. At that time the original number of 517-373-0908 will no longer be used. Lake Erie: Those willing to put in the time have caught a decent number of yellow perch in 18 to 20 feet of water near the River Raisin Channel and the E-Buoy. White perch, white bass and freshwater drum were also caught. Most of the walleye were caught in Ohio waters. Huron River: Is producing smaller white bass, smallmouth bass and panfish. Detroit River: Those looking for perch are fishing near the Cross-Dike or the south end of Sugar Island. Not many but the occasional walleye was caught. Lake St. Clair: Had clear water conditions. Smallmouth bass remain scattered in the deeper waters. St. Clair River: Smallmouth bass are showing up in all three channels. Walleye fishing was slow but some anglers did manage to find a few keepers in the shipping channel. Perch fishing also picked up. Lexington: Is still producing a mixed bag of Chinook, steelhead, lake trout and the odd walleye in 100 to 135 feet. Most fish were caught between 80 feet down and the bottom. Pier fishing was slow. Harbor Beach: Fishing started to pick up with some lake trout taken in 120 to 140 feet. Try dodgers or cowbells with spin-glows, peanuts or spoons just off the bottom. Salmon and steelhead were hitting on small or regular spoons in 90 to 120 feet. A few walleye were caught between here and Port Hope. Try 60 to 90 feet with small body baits and spoons or crawler harnesses. Bass are still hitting on spoons or body baits. Perch fishing was slow. Grindstone City: Was slow with only a couple walleye caught. Port Austin: Boat anglers trolling around the lighthouse caught smallmouth bass in 12 to 15 feet. Those heading out to waters 160 to 190 feet deep caught Chinook, lake trout and even walleye. The thermocline started about 110 feet down. Lake trout were within 10 feet of the bottom. Saginaw Bay: Walleye fishing is slow all over, and the perch have not really started yet. A few walleye were caught off Gambill’s Marina near Pinconning and off the mouth of the Kawkawlin River in 14 feet or west of Buoys 1 & 2 in 25 feet. A couple perch were taken near the Red Spark Plug (Buoys 11 & 12) but no big numbers yet. Perch fishing will improve as the cooler weather moves in. Walleye anglers on the east side had a slow week. Those trolling off Quanicassee, Sebewaing and Bay Port were lucky to get one fish per angler. Shiawassee River: Is producing the occasional walleye at the Corunna Dam and the spillway off Main Street in Owosso. Panfish and smallmouth bass were also caught. Most are using shiners or crawlers. Catfish numbers were down however the fish were bigger. St. Joseph: Had good perch fishing north of the piers in 35 feet. Salmon fishing was slow as the fish were scattered. A few were caught about 60 feet down in waters up to and beyond 140 feet deep. Pier fishing was slow. St. Joseph River: Warmer weather has slowed the steelhead bite. Target the deeper holes. Branch County: Near limit catches of panfish were taken from Morrison Lake. South Haven: Perch were caught north or south of the pier in waters 20 to 40 feet deep. Those trolling for salmon caught Chinook and coho along with the occasional steelhead in 100 feet. Pier fishing was slow. Holland: Salmon were hitting 40 to 70 feet down in 50 to 170 feet of water. Use 5 color lead and 150 coppers with bright orange or yellow spoons and green spinnies with green flies out deeper. Pier anglers caught a couple perch and steelhead. Try live bait such as minnows for the perch. For steelhead, go with shrimp under a bobber. Anglers were perch fishing off the State Park. Grand Haven: Perch are still being caught of both piers and just off the mud line in Lake Michigan. Minnows worked well. Boats are finding fish in 50 to 150 feet with downriggers set about halfway down. Most are using orange and yellow spoons up high or green spinnies with green flies out deep. Grand River at Grand Rapids: Steelhead were caught up near the 6th Street Dam in the early morning. With the warm temperatures, target the deeper holes. Bluegill and crappie fishing were fair to good. Catfish slowed but some big flatheads were taken on live bait, cut bait or crawlers. Grand River at Lansing: Continues to produce bass and channel cats for those using live bait. A few limits of panfish were reported. Try the backwaters for bluegill. Anglers might find a walleye or two near the Moore’s Park Dam. Clinton County: The inland lakes had mostly small bluegills. Muskegon River: Water levels continue to be low and clear. This may be good for bass fishing but not good for salmon and steelhead. Fish the weed beds for bass but try the deeper holes for trout. Whitehall: Catch rates slowed. Many were fishing around Minor Park but some traveled as far as Stoney Creek. The water near shore is very warm but seemed to be cooler near Stoney Creek. The bite was better in the early morning with fish caught on anything that glows before daylight. Try 50 to 70 feet down in 150 feet of water with green flashers and blue flies. Pearl J-plugs on lead core worked well. Pier anglers caught freshwater drum. Rockport: Has no set pattern for catching fish at this time. The thermocline is very deep or is not found at all in depths less than 100 feet. Fish are scattered and are difficult to target. Lake trout can still be found near bottom when fishing spoons. Some caught the occasional Chinook or Atlantic salmon. A few walleye were found and actually caught out in waters 120 feet or deeper. Long Lake: In Alpena County was producing good numbers of bass and pike. Alpena: Had few anglers fishing Thunder Bay because the walleye have moved out to deeper water. Some may still find the occasional walleye, bass or catfish. Thunder Bay River: Is producing the occasional rock bass, under-sized smallmouth bass, freshwater drum or channel catfish. Harrisville: Catch rates were slow as the fish are scattered and out deep. Steelhead should start to show up closer to shore. Try up near the surface in 50 to 70 feet. For trout and salmon, lead core and planer boards have worked best this year. Spoons with dodgers, wobble glows and body baits have caught fish but don’t be afraid to experiment with other bait combinations. Oscoda: A few salmon were showing up around the pier. Those fishing late night with glow spoons did catch a couple fish. Au Sable River: A few walleye were caught but no big numbers. The water is too warm for trout and salmon. Gladwin County: The inland lakes were producing limit catches of bass and panfish but anglers are working hard to get them. Clare County: The inland lakes are producing some nice bass. Tawas: Walleye anglers trolling out around Tawas Point and north to Au Sable Point found success in 50 to 80 feet. Fish were also caught in 20 to 50 feet off Alabaster and in 20 to 25 feet along the weed beds off Jerry’s Marina. Pier anglers caught walleye, large and smallmouth bass, rock bass and small perch. Au Gres: Walleye fishing slowed a great deal but those trolling did pick up the occasional 10 or 11 inch perch. Harbor Springs: Boat anglers were focusing their effort between Harbor Point and Five Mile Point. Try 65 to 70 feet down in 180 to 190 feet for salmon or 100 feet down for lake trout. Petoskey: Is producing a light number of salmon for those trolling between the hospital and the Water Treatment Plant. Anglers are using spoons and flies. Green was the hot color. Meat rigs with cut bait caught fish. The occasional lake trout was also caught. Pier anglers caught smallmouth bass and rock bass. Bear River: Water levels were low. Very few fish were seen jumping at the dam but some anglers were still trying for a steelhead or coho when still-fishing with spawn, flies, or rubber eggs. Those using crawlers at the dam caught a couple small brown trout and one nice brook trout. Charlevoix: Salmon are starting to show up in greater numbers but some boat anglers are still getting skunked. Many of the Chinook were more than 20 pounds. Try 50 to 80 feet down in 100 to 230 feet with spoons, dipseys, flies, squid and dodgers or meat rigs. Pier anglers are still catching smaller bass on leeches, crawlers or minnows. Traverse City: The East Bay is producing Chinook about 80 to 100 feet down. The bite was slow but those using meat rigs and flies seem to do best. Don’t rule out the occasional lake trout or whitefish. Smallmouth bass were deep in 20 to 50 feet. In the West Bay, salmon were caught 80 feet down in waters 100 to 150 feet deep. Most are running spoons, flies, and meat rigs. Those jigging in 100 to 150 feet caught whitefish and lake trout. Elk River: Anglers caught panfish and sub-legal smallmouth bass on live baits. Boardman River: A couple salmon and steelhead were spotted near the Union Street Dam however they will not be there long with the warmer temperatures. Frankfort: Anglers caught a good number of salmon between the Herring Hole and Platte Bay. Several large Chinook were caught right along with coho ranging 10 pounds or more. They are trolling plugs 40 to 80 feet down in 100 to 180 feet. Fish were caught on magnum spoons 30 to 100 feet down in 200 to 240 feet. Steelhead were up near the surface. West Platte Bay has been very good for coho. Anglers are using high lines or boards. Fish were caught just in front of the piers when using blue, pearl or chartreuse plugs or spoons that glow. Pier anglers casting blue and glow wobblers or Cleo’s caught a mix of Chinook, coho and brown trout. Betsie River: Has a few salmon and steelhead but no big numbers, it is too warm. Onekama: Those fishing the “Barrel” have done well for lake trout and the occasional Chinook or coho salmon. Those heading north to waters between 150 and 200 feet and trolling 40 to 80 feet down had some luck when they found bait fish. Early morning was best. Portage Lake: Had good bluegill fishing along the weed beds in 12 to 18 feet. A few nice perch were also caught. Water temperatures were a bit cool in the early morning but anglers will want to head out to deeper water as the sun comes up. Lake Cadillac: Is producing crappie, bluegills and bass. Walleye fishing was hit-or-miss. Some are trolling crawler harnesses or crank baits while others are still-fishing with a leech and slip bobber. Crappie were caught on the east end in the early morning. Lake Mitchell: Is producing some nice bluegills in eight to 12 feet of water. Try crickets, leaf worms, wax worms or butter worms. Manistee: Fishing was slow but some large salmon more than 25 pounds have been caught ion glow spoons or plugs in the early morning. Salmon and steelhead were also caught 40 to 90 feet down in 80 to 200 feet. Try green flies and meat rigs as well as orange or green spoons. Pier anglers caught a couple salmon on spoons. Manistee River: Was producing a decent number of summer steelhead up near Tippy Dam but warmer temperatures this week will once again slow catch rates. Manistee Lake: Those trolling did catch some salmon however south winds this week will slow catch rates. Ludington: The fish are scattered. Salmon can be found anywhere from 45 to 80 feet down in 50 to 300 feet. Try glow spoons and plugs or red and green meat rigs. Pier anglers caught the occasional salmon or freshwater drum when casting spoons. Pere Marquette River: Has salmon but no big numbers yet. Pentwater: Anglers caught salmon close to port. Some were taken 50 to 70 feet down in 80 to 90 feet or deeper in 150 to 180 feet. They are using green flashers and blue flies. Pier anglers were trying but few fish were caught. Smallmouth bass were hitting on live bait in the channel. Keweenaw Bay: The bite was hit-or-miss but trout and salmon were caught by those trolling from Sand Point to the red rocks and off Pequaming Point. Try spoons 25 to 75 feet down in 30 to 80 feet. Those jigging caught lake trout in 230 feet off Pequaming Point. From the South Portage Entry, anglers caught Chinook, coho and lake trout when trolling near the Lighthouse, the reefs, the red rocks and the Mud Banks. Fewer fish were caught from Traverse Bay. Marquette: Produced a few limit catches of lake trout. Average size was six pounds but some were 12 to 15 pounds. They are fishing at various depths in 110 to 220 feet of water between the white rocks and Granite Island. Try spoons and cut bait. A few coho were caught but no Chinook. Shore anglers fishing near the mouth of the Chocolay River had poor results. Stannard Rock had good lake trout action for those jigging or casting spoons. Menominee: Catch rates for salmon were very slow around Washington Island, Rock Island and Chambers Island. Walleye anglers are picking up a few fish especially at night. Try 20 to 30 feet when trolling north or south of the river. Fishing in Green Bay was slow. Menominee River: Is producing walleye in the evening for those trolling crawler harnesses or stick baits. Smallmouth bass, bluegill, crappie and perch were caught. Cedar River: Is still producing smallmouth bass for those drifting crawlers or casting stick baits. Little Bay De Noc: Walleye anglers were targeting the Second Reef off Kipling, and the “Black Bottom” in 14 to 23 feet of water. They are using crawlers or minnows. Perch fishing was fair to good off the mouth of the Escanaba River and near Kipling in 22 to 29 feet. Big Bay De Noc: A couple anglers were targeting walleye down near Round Island. Perch fishing was fair in 18 feet off Ansell’s Point. In Fayette Harbor, perch were taken on minnows and crawlers in eight to 14 feet. Smallmouth bass fishing was fair in Kate’s Bay, off Ansell’s Point and near the Bluff in eight to 21 feet. Try minnows, crank baits or plastics. Catch rates for salmon improved off Fairport. Try spoons 35 to 65 feet down in 80 to 130 feet. Au Train: Catch rates were slow but those willing to put in the time did catch a few east of Au Train Island and near Shelter Bay when fishing in 100 to 150 feet. Those fishing in deeper water out near the shipping channel and Wood Island had poor results. Surface water temperatures were in the low 60’s near shore and upper 50’s out deeper. Munising: Boats targeting lake trout and salmon had fair results in Trout Bay and Murray’s Bay in 100 feet of water or less. Those fishing the Big Reef reported good catches including several large fish coming in at 20 pounds. Pier fishing was light as catch rates were poor. Grand Marais: The majority of lake trout anglers are fishing in 100 to 250 feet of water in the shipping channel. Fish between three and 10 pounds were caught off the Southwest Bank. Those targeting coho did well east and west of the bay. Try halfway down in 50 to 60 feet. Shore anglers caught pike near the boat launch. St. Mary’s River: Out from Raber Bay, walleye have been caught at the Canadian Rock Pile when jigging orange and brown twister tails in six to 10 feet. Early morning was best. DeTour: Anglers continue to fish from Frying Pan Island to the #3 Green Can and to the #2 Red can near Drummond Island. They caught Chinook, lake trout and steelhead. Hot colors were watermelon, purple, green or any color with white on it. Drummond Island: Had a few reports of yellow perch were coming from the red buoy on the south end of Grape Island. They are drifting minnows in eight to 12 feet in the early morning. Walleye fishing slowed however a few fish were taken on crawler harnesses and bottom bouncers in 12 to 14 feet on the northwest side of Peck Island. Cedarville and Hessel: Perch anglers did well off the Hessel Pier and the north end of the Snows Channel when using minnows or crawlers in eight to 10 feet. Musky Bay, Middle Entrance and the Moscoe Channel are also producing good numbers of perch. Pike are there too for those still-fishing with chubs. Government Bay had excellent pike fishing in 10 to 16 feet. Good salmon fishing off Hessel in 70 feet or more. St. Ignace: Boats are still heading from the city launch to the flats and over to the Coast Guard Station and water treatment plant. Trout and salmon were caught around Bois Blanc Island, Round Island and the backside of Mackinac Island. Tip of the week: Sections of the 2013 Michigan Fishing Guide are now available in Spanish. Check out "Extractos de la Guia Pesca en Michigan"